Over the past two years, the Great Barrier Reef experienced unprecedented bleaching events that left hundreds of square miles of coral dead and dying. Events like this are only expected to continue as the planet’s temperature continues to rise. But amidst all the gloom and doom, a team of scientists are now offering a glimmer of hope. 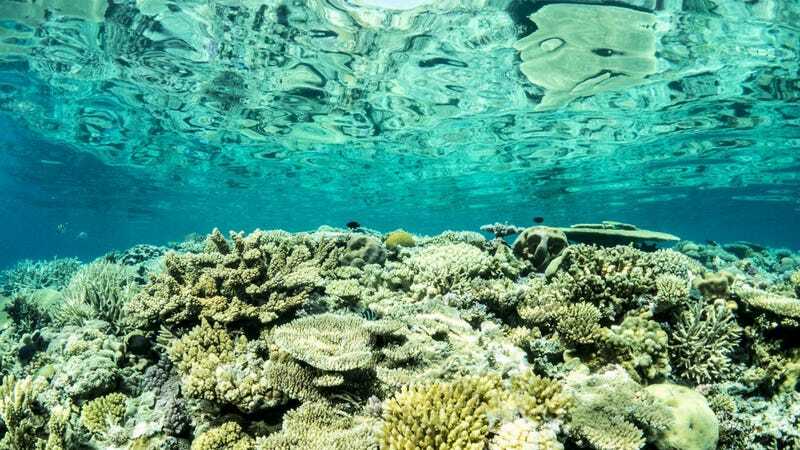 A new modeling study has identified 100 resilient reefs within the Great Barrier Reef ecosystem that, like mobile medical units, might help promote recovery of dead or dying sections. These hardy 100 reefs share several key features, including a low risk of exposure to bleaching, and high connectivity to neighboring sections of the reef. In theory, coral larvae born in resilient spots could reseed far-flung portions of the Great Barrier Reef following future die-offs events. For the study, the Australian and UK-based scientists used models of coral larval dispersal to identify which reefs are important sources of baby corals. They then used climate and oceanographic models to figure out which of those nurseries have a low risk of bleaching—which occurs when water temperatures rise above a coral’s comfort zone—and of outbreaks of crown-of-thorns starfish, a key predator. The reefs they identified were mainly in the southern, outer portion of the Great Barrier Reef. “This list of around 100 reefs is both a tangible and feasible set of intervention points to form part of a strategy for maintaining the systemic resilience of an ecosystem that is thousands of kilometres in scale,” the researchers write in the paper published Tuesday in PLOS One. It’s important to note that the researchers did not actually visit these 100 reefs to determine how healthy they are. At least one outside expert, NOAA Coral Reef watch coordinator Mark Eakin, says we should take the specific reefs identified by the new models with a grain of salt. The most important thing about the new study may be that it demonstrates a path forward for identifying resilient reefs within a larger ecosystem. “This is certainly an approach that should be used to determine the places where maximum protection may yield the best results,” Eakin said. That’s encouraging, because it’s become clear coral reefs are going to need all the help they can get surviving an onslaught of human-driven pressures, from climate change to pollution. If we can figure out how to identify resilient reefs now, and prioritize them for conservation efforts, then these incredible ecosystems really might have a fighting chance in the Anthropocene.